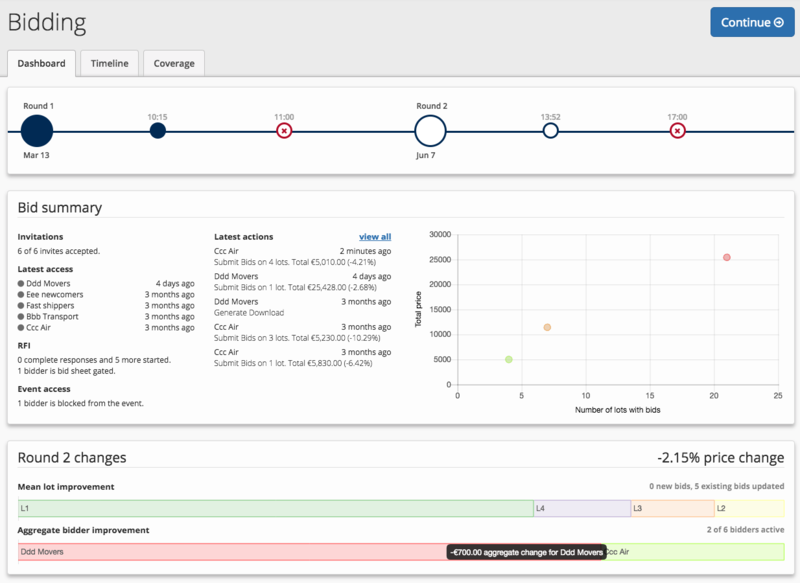 The ‘Activity’ tab gives an overview of all actions performed by all bidders in the event such as latest bid actions, time line of all uploads and downloads, and the coverage of lots from bidders. Navigate through the different types of Activity using the 3 tabs at the top of the screen. Invitations: How many sent invitations have been accepted and are yet to be sent as well as any failed invites. 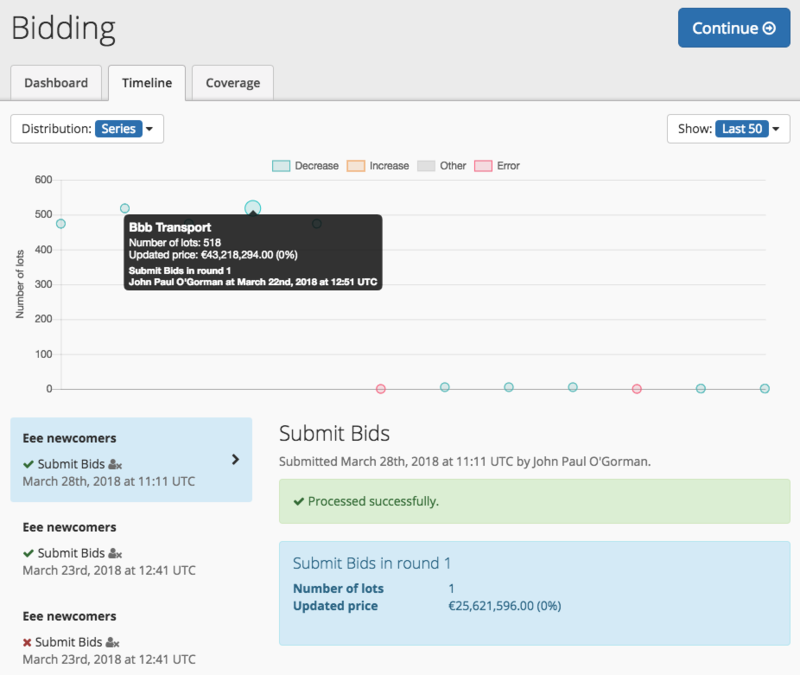 Latest Access: Which bidders have recently accessed the event. RFI: How many bidders have not started, are in the process, and have completed the RFI. Event Access: How many bidders do not have access to the event (blocked access). Latest Actions: Which bidders have uploaded and downloaded bid sheets. A graph on the right-hand side displays the ‘Number of Lots with Bids’ and the ‘Total Price’ for each bidders submitted bid (Fig 1). 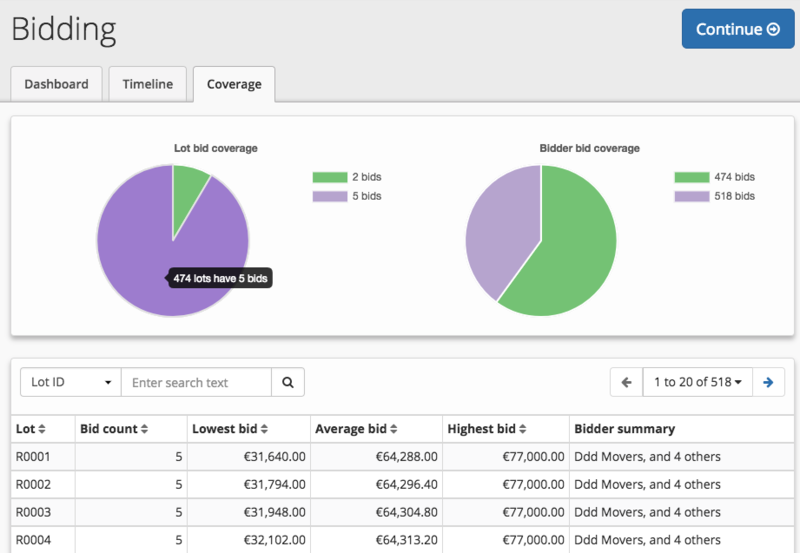 A Bar chart below the ‘Bid Summary’ displays price changes for each bidder and each lot separately. These changes can be viewed as ‘Mean Lot Improvements’ and 'Aggregate Bidder Improvements'. This tab displays any recent bid sheet uploads and downloads for all bidders. You can view the details of any bid sheet action, including the number of lots updated and the total price for each upload. Bid sheet submission errors will also be displayed. Bid Count: How many bids were submitted for that lot. Lowest Bid: The lowest value submitted on that lot. Highest Bid:The highest value received on that lot. Bidder Summary:Which bidders have submitted bids on that lot.